2013-14: Germaine has produced 7-9=16 through 24 games this season to match the second-highest goal and point totals on the team while setting new career-highs across the board…Her 81 shots rank third on the team…Tied a career-high with two power-play markers at Minnesota Duluth on Jan. 11…Added one power-play goal and scored the game-winner against Lindenwood on Jan. 1…Matched a career-high with three points on Oct. 11 at Lindenwood. The Mississauga, Ont., native has collected 15-24=39 with three game-winning goals in 119 career games played at Minnesota State. 2012-13: Placed fifth among Maverick forwards with 2-6–8 off 34 shots while playing in 35 games … Posted a career-high three points with two goals and an assist Jan. 1 at Lindenwood … Added a single-game career-high two assists in the series finale Jan. 2 … Scored the game-winning goal Jan. 1 at LU … An All-WCHA Academic Team honoree. 2011-12: She scored the game-winning goal :41 seconds into overtime in a 3-2 victory over #8 Mercyhurst on Oct. 7th…Collected 5-4–9 in 34 games…She fired 37 shots and was second on the team with a .135 shot percentage. 2010-11: Played in 28 games, owning 1-5–6…Recorded her lone goal of the season in MSU’s second contest against UND on Oct. 23rd. 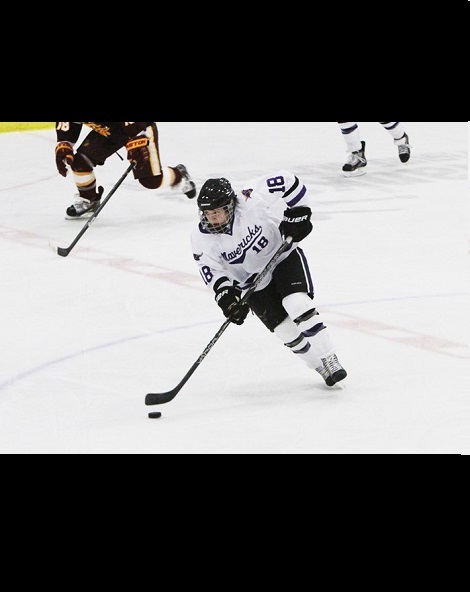 THE GERMAINE FILE: Former member of Shattuck-St. Marys U-19 Girls Team…Originally from Mississauga, Ont…Won the Midwest Elite League scoring title with Team Illinois…Won the Girls U-19 national championship in 2008-09…Daughter of Paul and Michelle Germaine…A proposed Business major.